Purdue was handed their first bad Big Ten loss at the hands of a Rayvonte Rice-less and Aaron Cosby-less Illinois, 66-57 in Champaign. Though it’s tough to really know with twelve B10 games left...I think I agree with Jeff Washburn, this might be the death blow for Purdue’s tourney hopes. The most discouraging part of that conclusion is how confident and fun this team can be while clicking on all cylinders. 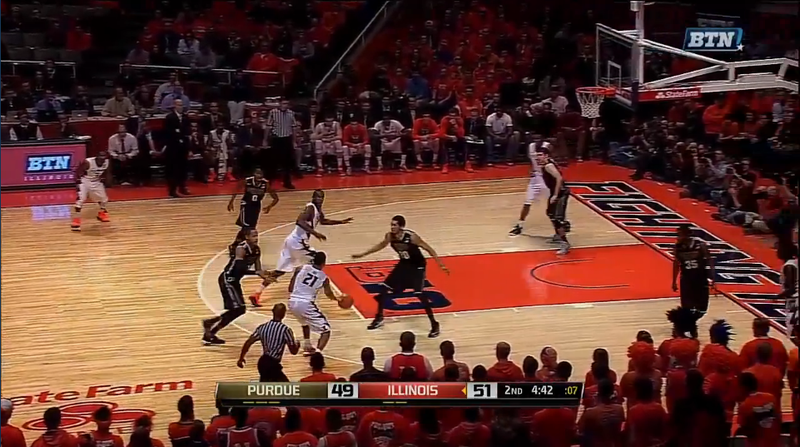 Tonight, from around 15:00 to 1:16 left in the first half, Purdue resembled that good team. The opening five minutes featured three Boiler turnovers, several botched post entry passes, rebounding miscommunications, and lots of aimless ball movement; hallmarks of the last two frustrating years. But the media timeout and the entry of Dakota Mathias breathed a new life into Coach Painter’s offense. Here’s where I praise two freshmen I’ve been particularly hard on: Mathias and PJ Thompson. After the media timeout, they ran a few beautiful pick-and-pop plays at the top of the key, and were making purposeful and energetic off-ball cuts. The importance of MOVEment (as Coach Painter undoubtedly pronounces the word) is fairly obvious: it keeps the defense moving, creating temporary passing lanes that can be exploited. And even though none of the jumpers were falling (though Purdue was getting good looks) the confidence of each executed play was palpable. A ton of this newfound energy can be traced back to Mathias, who (until the last 5 minutes of the game) had his best game as a Boilermaker. 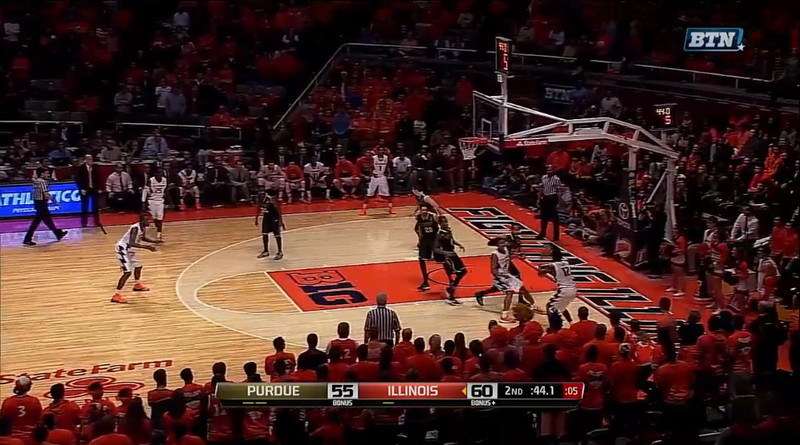 Defensively, Purdue was allowing a ton of virtually uncontested midrange looks, and the Illini couldn’t hit anything. This seemed 70% schematic (as long midrange shots are the least effective looks in basketball, particularly with the shorter college three point line) and 30% accidental (really late Purdue switches on screens). Either way, some missed shots and a complete lack of Illinois off-ball movement made it really easy for Purdue to crowd the strong side and force bad shots. But Illinois wouldn’t completely go away. Fueled by free throw perfection and a truck full of offensive rebounds, the Illini held the deficit to 7. Purdue hadn’t committed any turnovers since the opening five minutes, but couldn’t get any shots to fall to capitalize and extend the lead. And then Pepto-whiskey time started. Purdue was up by 6 with 1:16 left to play in the half. Jon Octeus headed to the bench after committing a shooting foul…probably because Coach Painter thought another quickly-whistled foul would severely impact his second half minutes. I have no problem with sending Octeus to the bench. Lead is down to negative-2. That’s right…Illinois had a 2 point lead. An 8-0 run in 72 seconds. Even though I’m not the biggest believer in sports momentum, it was undeniable that Hill’s three injected new life into the home crowd. It probably didn’t hurt that Purdue’s first made three pointer happened with just over 17 minutes left to play, courtesy of Dakota Mathias. Kendall Stephens left the game towards the end of the first half, and reports filtered out that he reinjured his dislocated finger. Painter decided to rest Stephens for the remainder of the game…but it turns out that playing without your leading scorer and only truly dangerous perimeter threat is less than ideal. Knowing this, Illinois backed off of everyone at the three point line and dedicated all of their manpower to clogging the interior passing lanes. This frustrated AJ Hammons, who got most of the second half minutes. 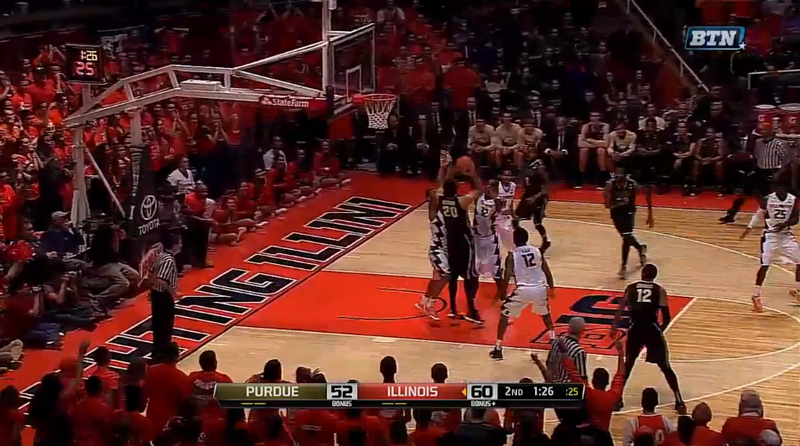 Every time AJ would get deep post position, Illinois would send two people to clog his space, resulting in AJ turning his body away from the rim as he went up for a shot. (See the GIF in “The Ugly” section below.) This lack of balance took away a lot of his offensive impact, which was sorely needed with Stephens on the bench. But, most importantly, Illinois hit 87.5% of their 24 free throws and iced their second home Big Ten victory….without two of their most important players. 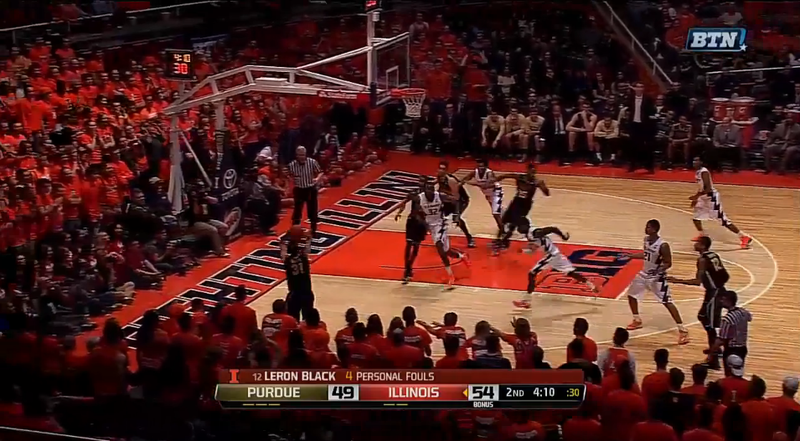 …Leron Black, in his first collegiate start, hit this baseline jumper to ice the game with 40 seconds left. But the offense really started to fall apart when Malcolm Hill hit a go-ahead three with 6:38 to play. Indulge me, if you will, as I sort through pictures of each offensive set after this point. Please notice that Malcolm Hill, the 6’6” 230lb sophomore guard, is on Hammons for the majority of these plays. 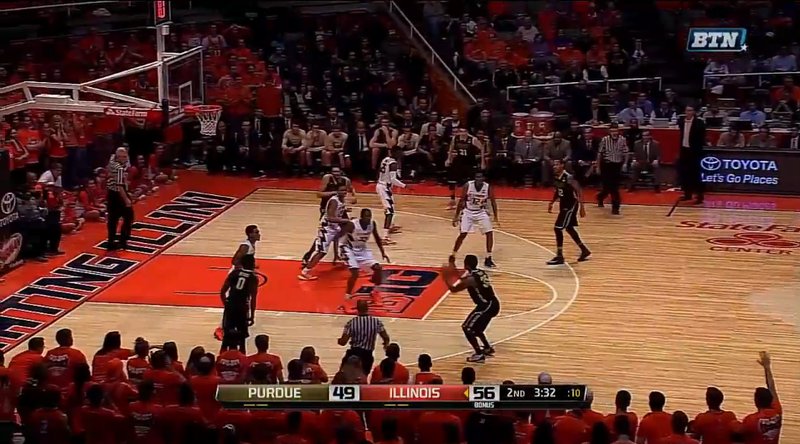 Check out the spacing on this play, when Davis is looking to capitalize on Hammons’ mismatch. Mathias is just standing in the strong side corner (this was the beginning of the end of his good game). Octeus is meandering in the middle of everything, probably daydreaming about becoming a guitar legend named “Captain Rockteus”. Needless to say, AJ never touched the ball, Davis almost turned the ball over, and this play ended with a desperation Dakota Mathias three point heave. A beautiful Malcolm Hill-Nnanna Egwu pick and roll. First, it’s perfectly executed. Props to Illinois for spacing the floor and giving this play room to breathe. But, really, this is exactly what NBA scouts don’t want to see from AJ. If AJ is going to either show or blitz the ball handler, he needs to do so much more aggressively. Slight contact with Hill shuts down this passing pocket and forces Hill to pick the ball up. But what I’m pretty sure he was supposed to do was a “soft” show, basically flashing in front of Hill to deny the driving lane while staying far back enough to prevent Egwu’s drive. Long story short, AJ got caught in the middle, and Egwu’s HUGE slam and-one over a rotating Mathias (rest in peace) energized the crowd and pretty much signaled the end of this game. After a timeout, a good inbounds play gets this wide-open corner three look by Mathias. I’ll take this 100 times out of 100. Obviously, he misses. Vince grabs Mathias’ rebound, gets a pretty open layup, but misses. 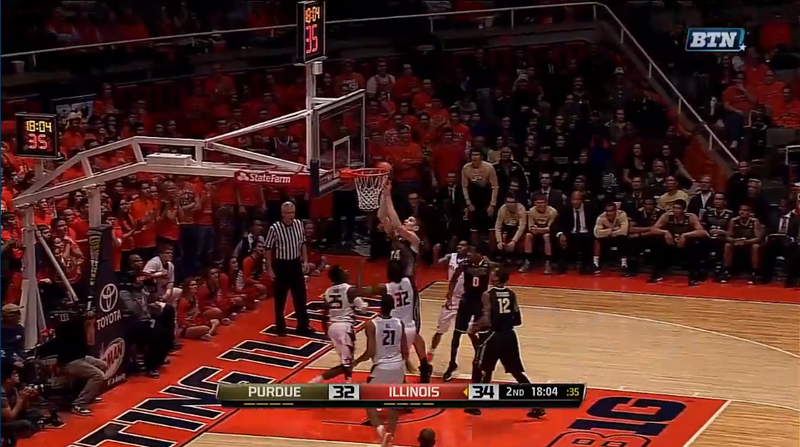 This would have cut the lead to 3, and could have been the most critical Purdue basket of the game. Instead, alcohol. 25 seconds of meaningless ball movement and failed attempts to get the ball inside to AJ results in a wide-open Ray Davis three. 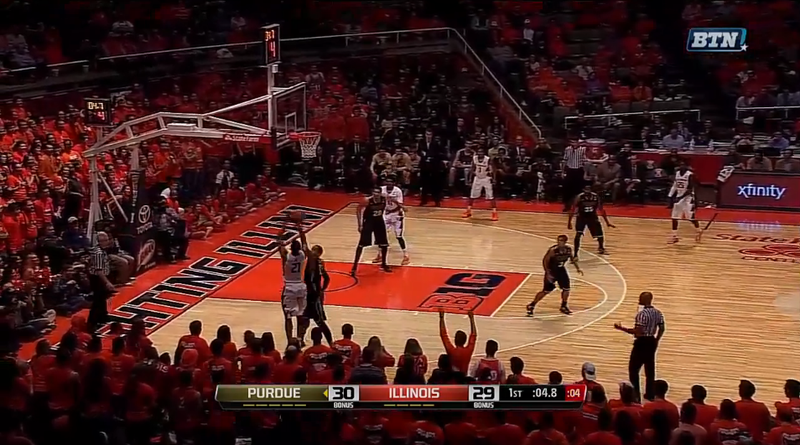 Illinois was absolutely giving up this shot on purpose. Ray hit the shot because The Captain don’t let his boys down. Ok, maybe he does sometimes. After some even more fruitless post entry pass attempts (and a near turnover), Purdue is left with 6 seconds and basically no options. Davis heat-checks a three from the exact same spot, but he’s guarded pretty closely. It bricks the rim. Finally, after 5 minutes, AJ gets the ball. 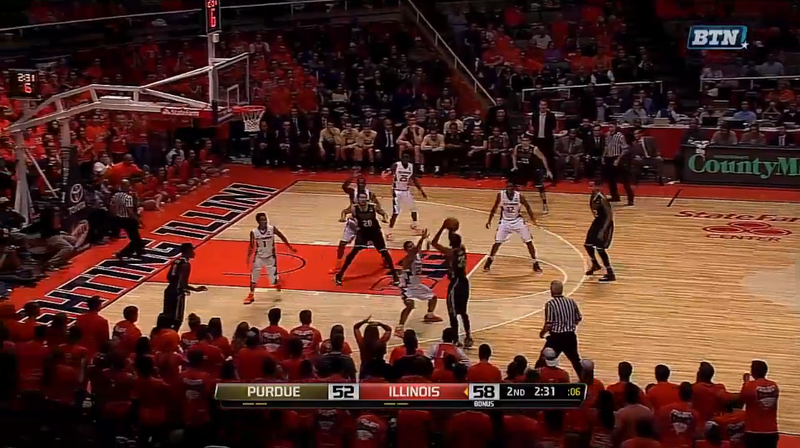 Unfortunately, Purdue is down by 8 and Illinois sends three people to make AJ’s life awful. He spins towards the help (instead of towards the baseline), contorts his body, and takes the ugliest looking shot of the game. He missed. 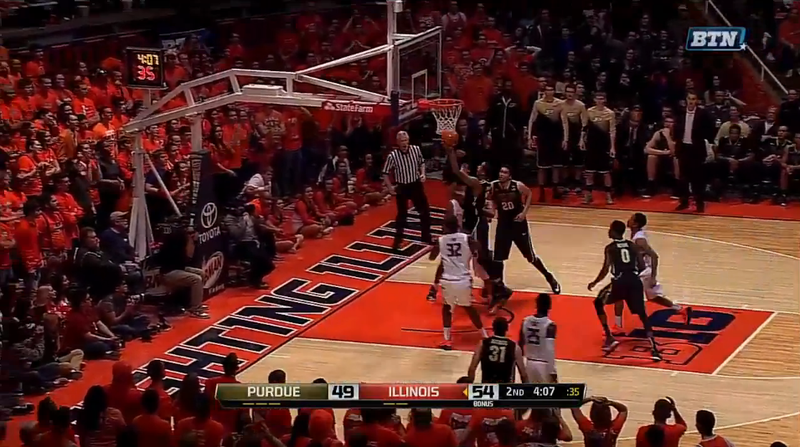 Purdue grabbed the offensive rebound, and Vince tried to hero-ball them into overtime. It didn’t work. Aaand that was pretty much the ball game. Very few good looks, a bunch of infuriating decisions by the players on the court, and more than several instances of being frustrated at the adults on (refs) and off (the coaching staff) the court. The first half stretch from 15:00 to 1:16. That Purdue team makes the tournament with ease. Unfortunately, 13 minutes and 44 seconds does not equal 40 minutes. Ray Davis diving into the crowd to try and save a loose ball, proving that he’s 100% hustle. Jon Octeus is all limbs and cannot be stopped if you give him an ounce of daylight. THE GREAT WALL OF HAMMONS blocking everything in sight. Before the game, he had a block percentage of 13.2, meaning he blocks roughly 13.2% of shots taken while he’s in the game. That…is good enough for 8th in the country, which is pretty freaking good. This remains AJ’s “elite” talent that he can show NBA scouts, but as we saw above a well-executed pick-and-roll pocket pass can catch him completely out of position. Take the good with the bad, I guess, and continue to marvel at TGWOH. 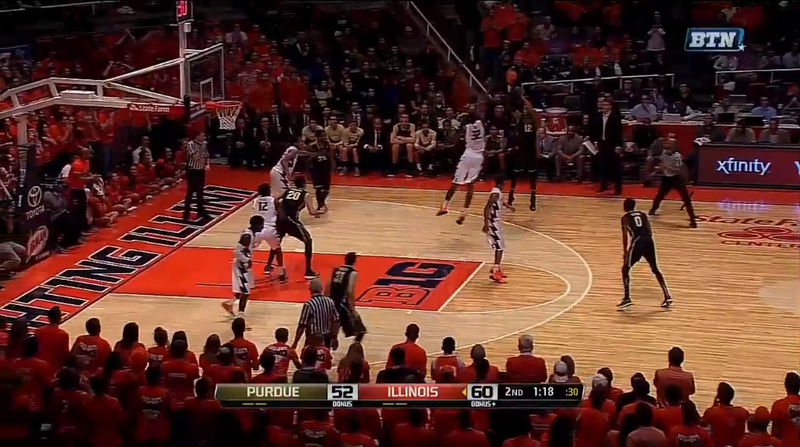 THE VINCE EDWARDS TO AJ HAMMONS ALLEY-OOP THAT *SPOILER ALERT* IS THE GIF OF THE NIGHT BELOW. The best of Vince’s passing and Octeus’ aggression and off-ball cutting, all in one short amazing GIF. This was lowkey the play of the game, absolutely gorgeous. I might post this to The Locker tomorrow, just so that more people see it. Every single thing about the last 1:16 of the first half, and the offense during the final 7 minutes of gameplay. Vince’s second half. 3 points on 1-7 shooting, 0 rebounds, 2 turnovers as Purdue’s offense slipped into a disjointed malaise. His passing fell off a cliff, and his shot took a 20 minute leave of absence. His “one half dominant, one half absent” outings are becoming a frightening trend. Not sure what Coach Painter wants from his big man rotation. 33 minutes for a visibly-frustrated AJ off the bench, 7 minutes for the starter Haas. They’ve both been at around 20 mpg this season, and AJ didn’t have many plays run well for him late in the game. Post passing creativity used to be a signature of this team, and now it’s slowly turning to a rarity. Another evening featuring barely any Bryson Scott. Speculate among yourselves on the reason for his benching. This GIF of AJ contesting a shot while Mathias and Smotherman just gaze longingly at the rebound, wishing to a genie that the ball just bounces in their hands. The offense without Kendall Stephens. Another instance of AJ not going up strong. He twists his body away from contact, instead of going straight up and absorbing it while drawing the foul. If only we could somehow fuse Hammons and Haas into one player…*sigh*. 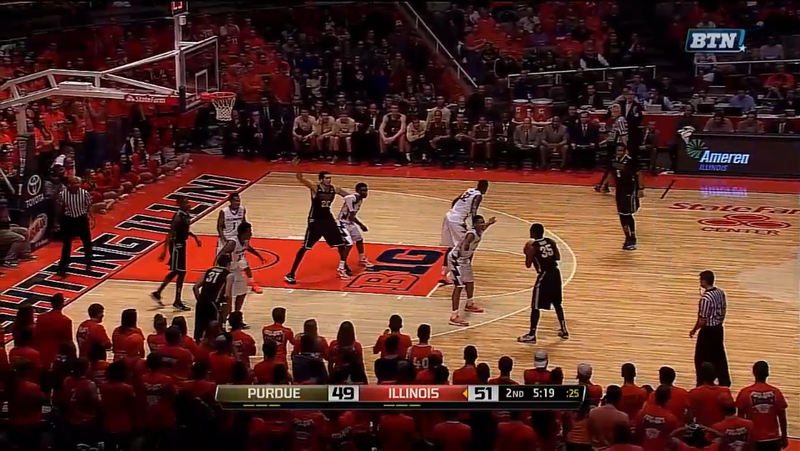 Vince Edwards alley-ooping to AJ Hammons is the easiest way to win my heart. Mike sent both of these tweets before the first half collapse. He's basically the oracle from The Matrix. Coach painter just asked Davis if he had anything left. Davis said ya and Painter replied with, "You better f-ing play that way."